Pick The Polisher Used By RUF Automobile !! The FLEX PE14-2-150 Rotary Polisher is built to minimise user-fatigue with an ergonomic design and lightweight body. The front of the polisher is perfectly curved to fit the user's hand and coated in rubber for superior comfort. The spindle lock mechanism is located behind the hump to prevent accidental knocks. This polisher is has been built to be light, agile, and fast - perfect for professional detailers who spend hours behind a buffer. This, as with all FLEX polishers, has some sophisticated electronics to help you get the best results. VR electronics include variable speed selection, consistent speed control by tachometer generator, overload protection, restart protection, and temperature monitoring. 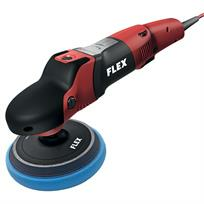 The FLEX PE14-2-150 Rotary Polisher is powerful! It has a 1400 watt motor with a no-load speed range of 380-2100 rpm. Capable of high speed compounding it also works smoothly when polishing at low speeds. The acceleration switch allows you to start slow and gradually increase speed. Lock the speed for continuous operation.